Many people across the country rightly celebrated the results of the November 2018 midterm elections – many progressive candidates with bold visions for the future won their races, including many supporters of LGBTQ equality. There were some exciting wins – and also some disappointing near-wins where the progressive candidate came up short, including in the Florida and Georgia gubernatorial races. What’s more, voter turnout was much higher than a typical midterm election, breaking records in some states. And at the heart of the election was a sense that more and more Americans are understanding the importance of turning out, speaking out, and wielding their power at the ballot. As the celebrations continued and campaigners seemed to retreat for a bit following the election, I was thrilled to be out on the streets of Asheville again just a few weeks later to register voters or help folks update their voter registration information. 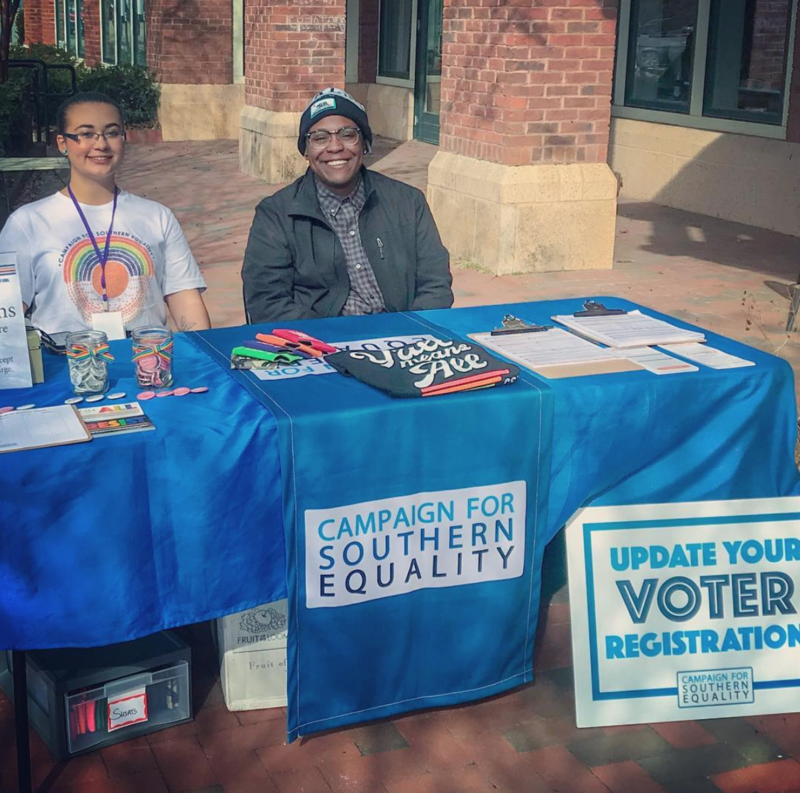 Since November, I’ve been out in Asheville and the surrounding area with colleagues from the Campaign for Southern Equality to encourage and educate folks on the importance of voting. We’re taking advantage of every opportunity – and creating some for ourselves – to get folks registered ahead of future elections, including the 2020 primaries, general election, and local elections. It’s not enough to rally voters weeks ahead of an important election. And it’s not enough for us to tune in as a progressive movement as a certain race heats up. We need to be registering voters throughout the year, checking in whenever we engage about an issue that matters to us. Local elections are the very basis on how change starts. The subsequent process and importance of voting locally has great ability to change state and federal positions, and we need to be voicing that to voters as well. Some folks (especially within marginalized communities) feel that they don’t have a voice – but oh, we do. We’ve witnessed this successfully happen with the turnout of voters in Alabama with their governor race. So it’s time that we tune in to our beliefs and turn up our voices, beginning with our vote. Every time one of my colleagues or I speaks to a North Carolinian about their voter registration, we speak about the issues that we care about: Issues like pro-LGBTQ policies, racial equity, economic justice, immigration reform. And when folks express dismay or confusion about what their role is, we urge them to vote – and as they do, to keep these critical areas in mind. Voting matters, elections have consequences, and we can’t achieve what we need without elected officials who get it. All of this is part of the Campaign for Southern Equality’s goal of achieving lived and legal equality for LGBTQ Southerners. By getting more voters registered and engaged in the work to tell a new story of the South, we’re building political power over the long term – and that’s what we’ll need to ensure that LGBTQ people across the South are treated equally in every area of life.